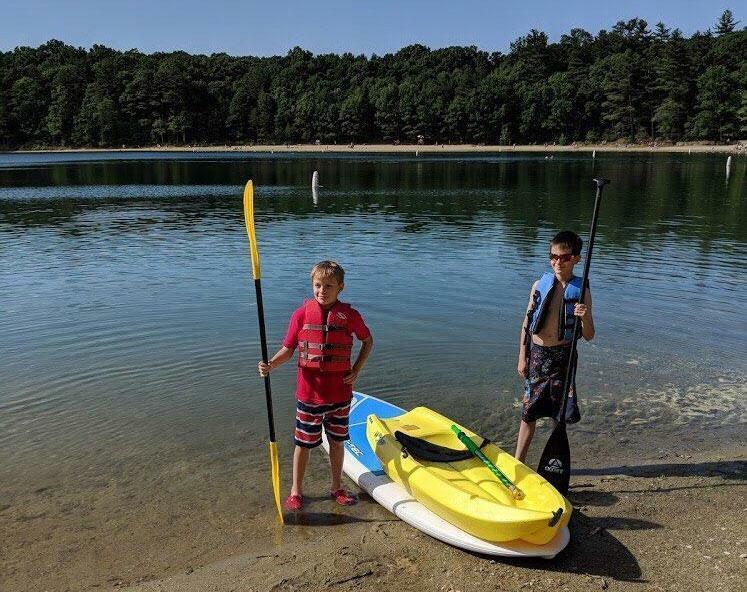 Herman Tsakhaev, 9, of Sudbury, and Bodie Thompson, 11, of Lincoln, were kayaking and paddle boarding on Walden Pond Sunday when they saw an adult struggling in the water. Their friendship had just started. “He was drowning, I think,” Tsakhaev said in a phone interview late Sunday. The two youngsters, who met an hour before the incident, hoisted the man onto Tsakhaev’s yellow kayak and paddled him to shore from the middle of the pond, Tsakhaev said. Tsakhaev said he thinks the man must have had a stiff leg. Sehnaz Thompson, Bodie’s mother, said she was confused at first as she watched her son make his way to the part of the pond she had asked him not to go to, because it was out of her sight. Little did she know he was trying to save a swimmer in trouble. “I started kind of, like, panicking,” she said in a phone call Sunday night, after Bodie had fallen asleep. To add to the confusion, people started congratulating her son and his new friend when they made it to shore. “I was like, you just saved someone’s life — that’s incredible,” she said. Bill Noke, Concord fire department shift captain, said he saw the boys upon arrival, after receiving a call about a distressed swimmer on the Lincoln side of the pond. The swimmer suffered a light cramp, he said. In an early evening tweet Sunday, the Concord Fire Department account lauded the two boys for helping the man until officials arrived to the scene. “It’s a great story — I mean, they saved a guy,” Noke said. For Tsakhaev, who said he is a second grader at General John Nixon Elementary School, it was just what he and his new friend had to do — be responsible. “Any person who would have ended up in the same situation” would have done it, he said.